Recently Sealoflex, a company that makes waterproofing systems to use on roofs, made the most of our classroom facilities and warehouse space (as well as a tasty lunch!) to host the first of their new training packages. This included demonstrations and hands-on practice for a group of flat-roofing contractors interested in using this system. We even had a flying visit from their CEO who had come over from America. Find out more about hosting your own Company Day at the Training Centre. The company made full use of our classroom facilities, at the Training Centre, including bringing their own presentational kit. Sealoflex used our warehouse space to set up their practice rigs. The contractors were able to get some hands-on experience of the product. 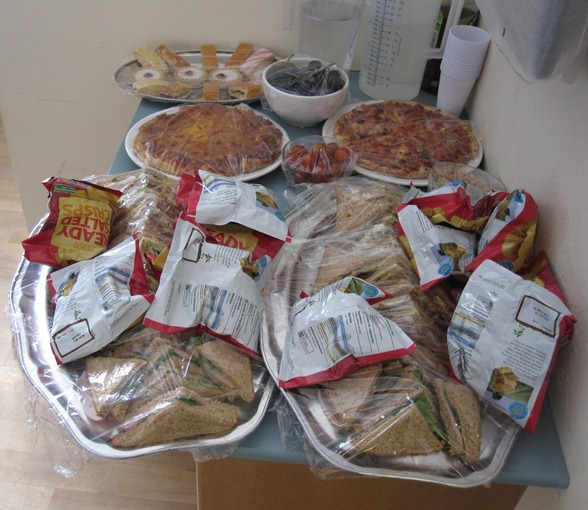 We provided a tasty lunch to keep everyone going throughout a busy day!